Today is Giving Tuesday, a day when people around the world give back to their communities and donate to organizations whose work they appreciate. We hope you’ll consider making a contribution to support the Philadelphia Student Union. 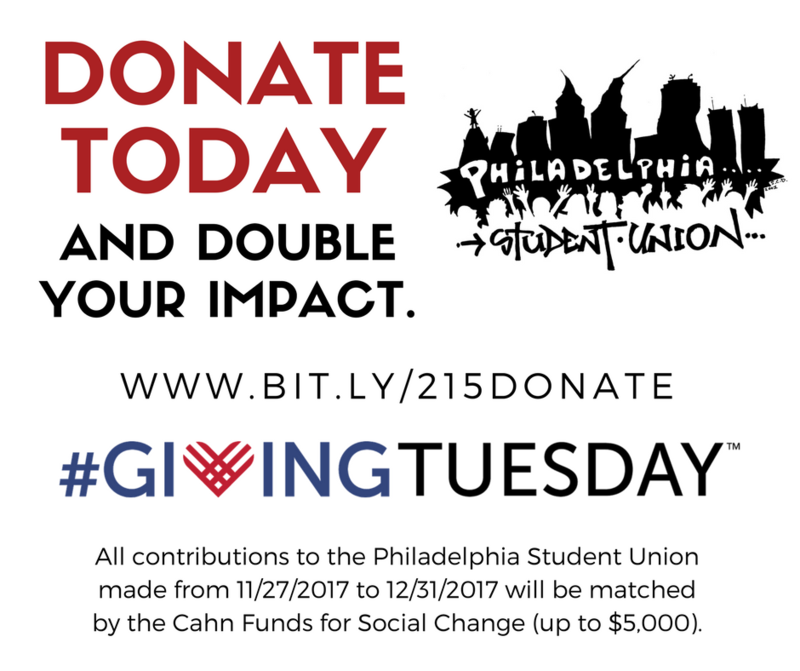 We’re excited to announce that all donations made to the Philadelphia Student Union for Giving Tuesday will be matched by the Cahn Funds for Social Change, up to $5000! All week, if you donate to PSU to support youth organizing, leadership development, and the fight for educational justice in Philadelphia, your gift will be doubled. The Philadelphia Student Union has survived and thrived for the past twenty-two years thanks to your commitment to supporting student leadership and your belief in our vision of a better world. Make a donation today to fund youth organizing, leadership development, and educational justice in Philadelphia, and your gift will be doubled.